The Companies (Amendment) Bill, 2017 passed by Lok Sabha on July 27, 2017, received the assent of Rajya Sabha on December 19, 2017. The major amendments proposed include simplification of the private placement process, rationalization of provisions related to loan to directors, omission of provisions relating to forward dealing and insider trading, doing away with the requirement of approval of the Central Government for managerial remuneration above prescribed limits, aligning disclosure requirements in the prospectus with the regulations to be made by SEBI, providing for maintenance of register of significant beneficial owners and filing of returns in this regard to the ROC and removal of requirement for annual ratification of appointment or continuance of auditor. 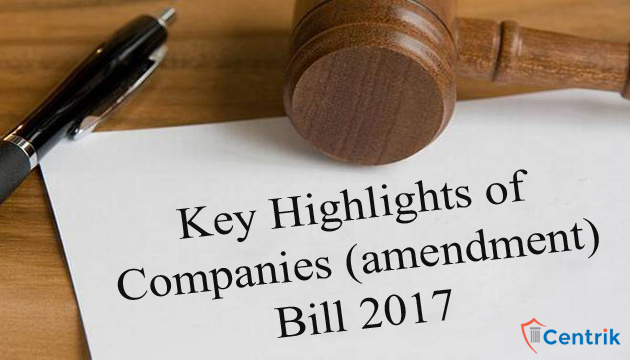 We hereby listing few of the highlights of Companies (Amendment) Bill 2017. For incorporation of company declaration will be required instead of affidavits. Name reservation in case of new company shall be valid for 20 days from date of approval instead of 60 days from the date of application. Annual General Meeting of unlisted company can be held anywhere in India. Every company shall have registered office within 30 days of incorporation instead of current requirement to have registered office within 15 days. Notice of every changes of situation of the registered office shall be given to ROC within 30 days instead of 15 days as currently provided. Sweat equity shares can be issued at any time currently it can be issued after 1 year from commencement of business. In addition to Directors & KMP, any employee of the company can also authenticate company documents as authorized. Wholly owned subsidiary (WOS) of a company incorporated outside of India is now allowed to hold EGM outside India. No central govt. approval required for payment of remuneration in excess of 11% of net profit. Money received under the private placement shall not be utilized unless the return of allotment is filled with the ROC. Central govt. Can provide any other number to be treated as DIN like Aadhar or Pan. Where a director incur any of disqualification under section 164(2) due to default of filing of financial statement or annual return or repayment of deposit or pay interest or other mentioned in section, than he shall be vacate office of the director in all the companies other than the company which is in default. Requirement of filing of form DIR 11 (Filing of a copy of resignation to ROC by director itself) made optional. CG will prescribe an abridged Board Report for One Person Company and small company. Disclosure which has been provided in the financial statement shall not be required to be reproduced in the Board Report again. Disclosure by promoters and top ten shareholders with respect to 2% change in shareholding in a listed company is omitted. In case delay in filing documents, fact or information required to be submitted under section 92 (Annual Return) or 137 (copy of financial statement), after expiry of prescribed period a flat additional fee of Rs.100 per day shall be paid instead of slab wise additional fee. For calculation of net worth of the company debit or credit balance of profit and loss account shall be included.